Laid Off Camp Phoenix is taking place again tomorrow! And while it’s been sold out for weeks, we wanted to be sure that everyone out there is aware of this fabulous event. If you’re lamenting that you didn’t get a ticket to this one, there will be another one in October. You can also follow along with their Twitter account for updates. For those who don’t know, Laid Off Camp Phoenix is an extension of a national effort to help people find work — full-time work, freelance work, volunteer work, or whatever’s next for them. Like other Laid Off Camp events, this is a locally-based, community-supported effort to offer resources and reassurance to job seekers. Laid Off Camp is very different from the job fairs that jobseekers typically attend. Twice a year they host an all-day series of seminars and workshops covering a variety of topics designed to help jobseekers make the next step and achieve their goals. In addition to seminars, they offer free services such as resume reviews, free avatar photographs for online use, and lots of volunteers whose sole mission for the day is to help connect attendees with others who can help them find work. The entire day, including breakfast and lunch, is free for all attendees. All speakers are volunteers, and food and beverages are donated by sponsors. There are a wide range of attendees — from young people who haven’t yet found a job, to those who have lost a job after 40 years with the same employer, to those wanting to make a change that just don’t know how. People who have been laid off for two weeks, and others who have been out of work for two years. We’re proud to support Laid Off Camp and want to wish Organizer Susan Baier and all her volunteers an easy day tomorrow. And we have confidence that all the attendees will come away with resources and a renewed sense of hope and community. If you’re wondering how you can help, click here. 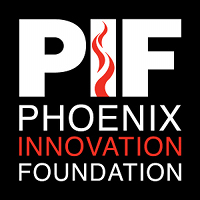 The Phoenix Innovation Foundation is a Phoenix, Arizona-based Nonprofit whose mission is to educate and promote the development of the local Phoenix-metro community through community-based art, science, and technology events. We sponsor any or all free, public, and community-run events—whose mission parallels our own—through the donation of logistical and legal support, as well as the administration of charitable funds.